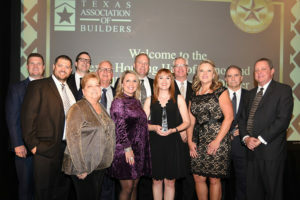 On November 15 in Austin, TX at the Texas Association of Builders fall board meetings, GHBA was awarded TAB’s 2018 Philanthropist of the Year for the association’s community efforts following Hurricane Harvey. TAB recognized GHBA for its membership education; advocacy efforts, including GHBA’s support of Harris County’s $2.5 billion flood mitigation bond package; and charitable outreach, specifically, the creation of BuildAid in partnership with HomeAid Houston and the David Weekley Foundation. TAB’s Philanthropist of the Year has traditionally been awarded to an individual, but TAB chose to recognize the entire GHBA for its rebuilding and educational efforts in the aftermath of Hurricane Harvey. TAB even produced the video above to honor the GHBA. Congratulations to the GHBA and its many members who participated in the association’s Harvey-related activities over the last year! It was a team effort!